I long for the days when I could simply write a few interesting if not good lines of poetry. In my younger years I wrote and drew pictures daily. My poems stood strongly on their own, and my sketches were often striking. My best writing of the college years were my poems. I took a few poetry writing classes in college and they were great, we read poems by published authors and each other and were required to keep a journal. One semester I produced nearly 12 exceptional poems. Sadly, I’ve lost them in the ether. Somewhere they may exist on a hard drive or printed out at a friend’s house, but I don’t have them anymore. At any rate, http://www.dot.com crept into my life and overtook it. I became engrossed in TCP/IP and truly loved it. I was excited about the possibilities of sharing information. That was what first drew me to the web, the fact that it was a giant information sharing session. I was fascinated by the fact that you could mark up text and a browser would format it into something readable and a server would deliver it thousands of miles away. Somewhere in the late 90s that changed and the Web became a means to the end of making money. Ecommerce sites sprang up, and well, frankly kept me employed for the past ten years, but they were nothing like the original, somewhat naive and altruistic, sites that existed on the web. I always felt like we lost something when that happened. Now we have Web 2.0. Social Networking sites, blogs (like this one) and all manner of other communications built upon the fabric of the Internet. There are a lot of really creative and mind-blowing sites out there on the wild willy web. And yet, I think we’ve lost something. In this day and age when we are more fully connected than ever before, I feel completely disconnected from the real world on a frequent basis. And even more disturbing, somewhere in this mass information sharing experiment I seem to have lost the ability to create things with pen and paper. I even have trouble simply taking notes by hand in a meeting. We share a notebook preference! 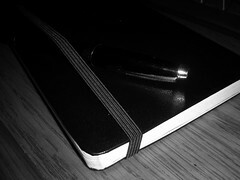 Yes, I have a bit of an addiction to the moleskine as well. I hope you are right about it being like riding a bike, but I’ve got to admit, I’ve been trying to get back into both writing and drawing for some time with limited success. I think the first step is probably to start a journal again – something besides this blog. Thanks for the encouragement. Pingback: Three Facts, One Unsubstantiated Conclusion « . : s t e a d y . org : . Pingback: Found: Old Poems | . : s t e a d y . org : .